Math by Myself is one of three tasks children choose from during the independent work time. Targeted activities and kinesthetic practice build deeper understanding of math concepts. These prerequisite lessons set the stage for productive and engaged rounds of Math by Myself, which is one of three authentic math choices that help students reach their math goals. Select a topic below to browse supportive resources. Activities and games give students opportunities to explore fundamental number concepts, deepen mathematical understanding, and cultivate mathematical reasoning skills. To maintain independence, students may need additional prerequisite skills before launching Math by Myself. Tool kits are introduced so that students know where to find them, how to choose and use tools, and how to put them away. Math fluency and stamina can come to a screeching halt when a student gets stuck. This important lesson will help them make strides instead of stumble. Once foundation lessons have been learned, a joyful and successful launch can commence. Primarily activity based, Math by Myself provides kinesthetic practice that helps students develop deep conceptual understanding and mathematical proficiency. 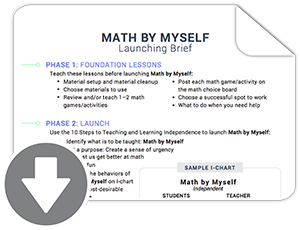 This one-page guide will help you remember what foundation lessons to teach before launching Math by Myself and what essential behaviors need to be placed on the I-chart.